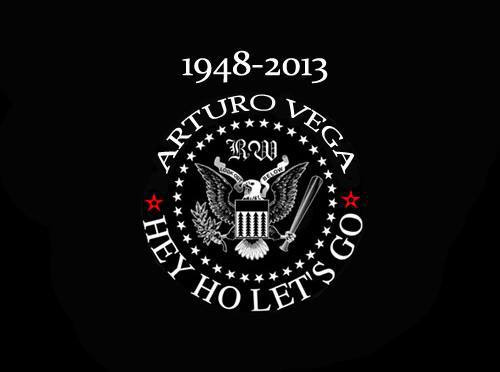 Arturo Vega, the man who designed the Ramones' indelible logo, and was the the band's artistic director for 22 years, died Saturday (June 8), announced friend and Please Kill Me author Legs McNeil on his Facebook page. First reported by Slicing Up Eyeballs, McNeil wrote: "Sleep gently my dear friend, you were the must optimistic, jubilant and fun pal anyone could wish for. I don't know what the world will be like without, nor do I want to even imagine it... But I know you will find eternal happiness wherever you end up....I love you Arturo." Read more in Spin magazine.